"iLOE" (iPhone Little OpenStreetMap Editor) was built to use the "iPhone" and the "iPod Touch" to update and insert nodes in OpenStreetMap. Since Version 1.8. you can even update ways. iLOE 1.9 is now available in the app store. And i just started an iPad Version. iLOE is number 8 in the OpenStreetMap Editor usage stats. iLOE resulted on my own wish to add or alter nodes while being on the way. 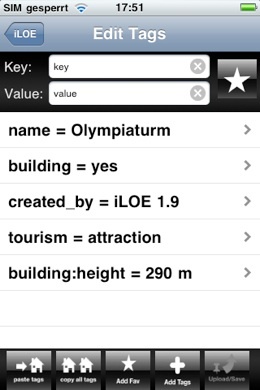 And it was the first OSM Editor on the iPhone. (See also „iLOS“, an OpenStreetMap Viewer with very good and fast search and tracking possibilities). Now you can add and edit OSM data on the spot. Localize your position. Search for any city (worldwide). Move the search target on the map. Download the nodes and ways around your or any position. Edit, delete and insert tags in the node and ways. Copy and paste all tags from a node. (This makes it a lot easier to tag buildings in a street for example. You can paste all the street and city information and just have to change the house number). 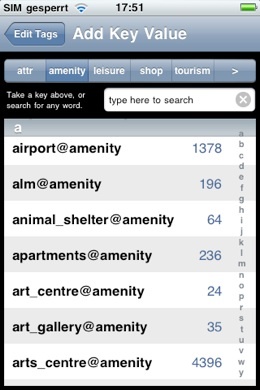 Tag dictionary for map featuers. Upload the node to OpenStreetMap. In info->settings enter your user/password for OSM. Go to the position where you want to add or alter node (by localization or manualy). Download the nodes (and ways) around. Select the node you want to alter or put crosslines at new position and select „New node“. If you want to move a node, select the node, move the crosspoint on the map to the new position and select „move“. Then upload. Alter tags by overwriting values. Add tags by overwriting key and value. Or simply add. Go back to the main screen and download again to see your changes. PS: .See Blog for more information. Map and data is (c) by OpenStreetMap and contributors, CC-BY-SA. OpenStreetMap data is growing daily through thousands of contributors and you. The application needs an internet connection and the OpenStreetMap servers to be up and running to work.